Solar Light offers one of the most comprehensive lines of radiometers in the industry today, to serve any niche in light measurement.These units are offered under the PMA-Series, Specialty Meter, and Solarmeter® banners. Our laboratory-grade PMA-Series PMA2100 and PMA2200 meters can each be used with over 85 of our PMA-Series Sensors, allowing a single meter to serve as aphotometer, a pyranometer or a UV meter simply by changing the sensors! Advanced data logging and software packages are available as well, for total versatility. Solar Light’s specialty meters target specific applications, such as the SL-3101 Scotopic / Photopic meter with on board calculations for Perceived Brightness, Visual Effectiveness and the S/P Ratio. 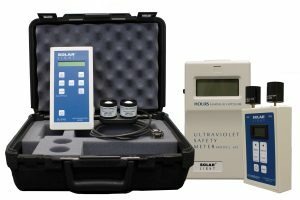 We also offer safety meters such as the Model 6D for detecting hazardous UV in the workplace per ACGIH guidelines, and the UV Minder® Model 3D to measure the UV from sunlight or artificial sources, including sensitive versions designed for Xeroderma Pigmentosum patients. Finally, we manufacture the exciting Solarmeter® family of specialty hand held light meters for consumer, light industry, zoological, and life sciences applications. These affordable but extremely accurate radiometers have a 25+ year track record as the industry leaders for a variety of uses, including precise UV index measurement for reptiles and humans, measuring lamp irradiance vs. aging, window film tint measurement, UV curing, sterilization lamp measurement, red/blue light phototherapy, LED measurement, and photovoltaic (PV) solar irradiance metrology. Solar Light’s versatile NIST-Traceable PMA-Series Datalogging Radiometers / Photometers are designed for scientific professionals, offering unparalleled accuracy and flexible data management. These unit accepts over 85 different PMA21xx-Series sensors measuring UV, Visible, and IR wavelengths. Choose from the advanced Model PMA2100 Dual-Input Data Logging Radiometer or the standard Single-Input Model PMA2200. 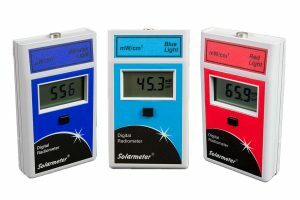 Solarmeter® is Solar Light Company, Inc.'s brand of specialty hand held light meters for consumer, light industry, zoological, and life sciences applications. These affordable but extremely accurate radiometers have a 25+ year track record as the industry leaders for a variety of uses, including precise UV index measurement for reptiles and humans, measuring lamp irradiance vs. aging, window film tint measurement, UV curing, sterilization lamp measurement, red/blue light phototherapy, LED measurement, and photovoltaic (PV) solar irradiance metrology. These meters provide long term accurate measurements for both low and high intensity lamp systems, in order to enable proper output and aging determination. A wide selection of these NIST-Traceable instruments is available for UV, Visible, and IR measurements, as well as customized or OEM / private label requirements. 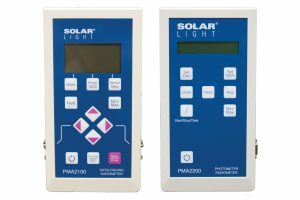 Solar Light offers a wide selection of specialty purpose meters for professional research, scientific, clinical, educational, and industrial applications. Leveraging our field-proven photometer and radiometer baseline designs, these Specialty Meters allow users to take ultra-accurate readings quickly and reliably, increasing productivity and throughput in every project!